I love vintage textiles. There is something special about them. I especially like vintage pillowcases. There are many vintage pillowcases that have been hand embroidered with such attention to detail that no machine could ever reproduce. I'm lucky enough to live in the south where there seems to be an abundance of vintage pillowcases. I've seen them everywhere from flea markets, yard sales, antique shops, and second hand shops. Some are embellished with simple embroidery, others with crochet trims, and some are just spectacular and blow your mind away! I found a pair of matching pillowcases at a local antique shop and I turned one of them into this beautiful peasant top for a little girl. The embroidery is done by a machine but it was in such wonderful condition that I couldn't resist them. - Check for yellowing. Sometimes you can only see these spots in natural light. 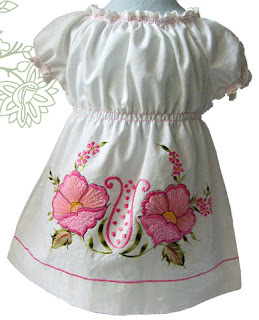 - Flip the pillowcase inside out and check to see if the embroidery floss is still in good condition. - Check for fraying threads especially along fold lines. Have fun browsing and enjoy the art of days gone by. Just gorgeous! Very nice design!